Caprolactone monomer is a reactive cyclic-lactone ester which is easily ring-opening polymerized to produce a wide variety of performance intermediates with advanced polymer architectures based on the polycaprolactone unit. In reactions with a broad spectrum of nucleophilic “initiators,” the caprolactone monomer allows highly tunable, shaped polymeric structures with exact terminal primary hydroxyl or carboxylic acid moieties. Exemplary performance intermediates produced from caprolactone monomer include (meth)acylate macromonomers with end-functional primary hydroxyl moieties; polycaprolactone diols, triols, and tetraols; and high molecular weight polycaprolactones. The flexible polycaprolactone chain affords attractive property sets like low temperature flexibility, adhesion, chemical, thermal, and abrasion resistance, elasticity, durability, and compatibility with other materials. End-use market applications are numerous in fields like coatings, adhesives, sealants and elastomers (CASE), urethane cast elastomers, thermoplastic polyurethanes, acrylic resins, printing inks, flexibilizing additives, and polymer modification. 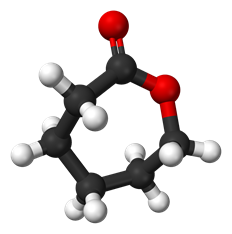 Caprolactone is a colorless, low viscosity liquid with a melting point of -1.3 °C and a boiling point of 237 °C. This monomer is available from Gantrade Corporation as Placcel® M (Daicel Corporation) with a purity greater than 99.5 percent. Caprolactone cyclic ester derives its name from caproic acid, a six-carbon carboxylic acid (i.e. hexanoic acid). When ring-opened, the resulting repeating chain has six carbons, as revealed above. The polycaprolactone chain in a polymeric structure is also biofriendly. The rate of biodegradation is adjustable using the crystallinity profile. Thus, a decrease in the polycaprolactone chain crystallinity leads to an increase in the rate of biodegradation and/or bioresorption profiles. Ring-opening polymerization of caprolactone monomer offers an attractive alternative to the step polymerization of polyesters from diacids and diols. Caprolactone is an ideal intermediate for the ROP process because of the physical characteristics of this seven-member lactone, the torsional strain in the molecule which facilitates anionic ring-opening, and high associated conversion rates. This torsional strain is revealed in the caprolactone model. An infinite number of “initiators” can be employed, hydroxy, amine, carboxylic acids, etc. Formulators can mediate the ROP of caprolactone with high activity catalysts such as tetrabutyl titanate, tetraisopropyl titanate, stannous octoate, dibutyltin dilaurate and super acids. Please see below the descriptions of product families produced from the caprolactone monomer. An additional end-use application under consideration is in the area of reactive diluents. Vinyl and acrylic monomers such as hydroxyethyl methacrylate (HEMA), hydroxyethyl acrylate (HEA), hydroxypropyl acrylate (HPA), allyl alcohol, glacial acrylic acid and glacial methacrylic acid can react with the caprolactone monomer to produce acrylic marco-molecules containing the polycaprolactone chains with a hydroxy or carboxylic acid end-termination. These end-functional acrylic or vinyl oligomers are used in free-radical polymerized acrylic resins systems, and they are subsequently reacted with isocyanate and melamine crosslinking agents. By positioning the primary hydroxy group away from the main chain of an acrylic resin, formulators use these monomers to greatly facilitate reactions with the crosslinking monomers. Formulators have two options for preparing a caprolactone-modified acrylic resin. The conventional method is to copolymerize caprolactone-modified hydroxyalkyl (methacrylate) monomers, prepared by grafting caprolactone monomer onto for example HEA or HEMA. This process requires temperatures below 120 °C to affect the caprolactone ring opening graft-reaction without thermal induced polymerization of the acrylic moiety or inter-esterification reactions that lead to di(meth)acrylates. Di(meth)acrylates are undesirable side-products that increase viscosity and gels on polymerization. High activity ROP catalysts such as stannous halides and dibutyltin oxide cleanly afford the caprolactone-modified (meth)acrylates without this side reaction (USP 4,916,254). The structure below shows the caprolactone-modified (meth)acrylates derived from this route, referenced as hydroxyalkyl caprolactone (meth)acrylates. Note that carboxy-terminated polycaprolactone acrylates are also commercially available. Vinyl monomers used in copolymerizations with the caprolactone modified hydroxyalkyl (meth)acrylate oligomers include methyl methacrylate, butyl acrylate, 2-ethylhexyl acrylate, styrene, hydroxyalkyl (meth)acrylates, and glacial acrylic and methacrylic acid. Increasing the content of the caprolactone-modified (meth)acrylate increases flexibility, low temperature properties, adhesion, chemical resistance, and reactivity with crosslinking agents like Cymel 303 melamines or diisocyanates. An alternative route to the above acrylic resin is to directly graft the caprolactone monomer onto an acrylic polyol or to simultaneously graft the caprolactone monomer during co-polymerization of acrylic monomers, which include HEA or HEMA. A drawback of these alternative method is that higher temperatures are required and the ROP catalyst remains in the resin, where it can lead to color generation. The crosslinkable caprolactone-modified acrylics are used in automotive coatings, plastic and elastomer coatings, cementitious coatings, powder coatings, paints, adhesives, and printing inks. The hydroxyalkyl caprolactone (meth)acrylates may also reacted with isocyanates to produce urethane acrylates used in UV-cured coatings and 2K polyurethanes. These oligomeric urethane acrylates improve durability and impact resistance, adhesion, weatherability, and flexibility. For these reasons, formulators use them in clear-coat automotive formulations, both 2K urethanes and UV cure. The table below lists a series of Placcel® caprolactone acrylates and methacrylates produced by Daicel Corporation, with varying levels of caprolactone monomer. The inhibitor is MEHQ at a level of about 500 ppm. Pt-Co color values range for 15-45. 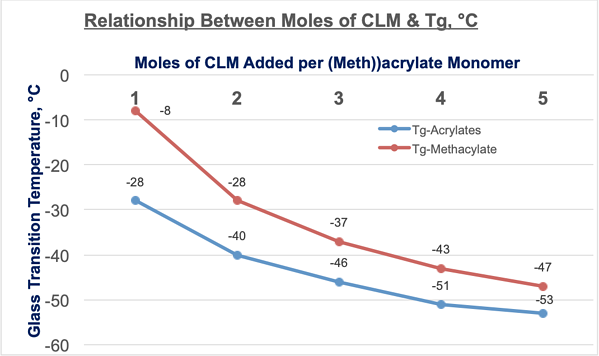 The following figure shows the relation between the Tg of the Placcel® acrylate (FA series) and methacrylate (FM series) oligomers and the moles of caprolactone added per molecule. As the content of caprolactone units increase, the Tg contribution of the resulting acrylic monomer decreases, with the acrylate, as expected, exhibiting a lower Tg vs. the methacrylate counterpart. An exclusive ring-opening polymerization (ROP) process in which a low molecular weight polyol “initiator” is reacted with the caprolactone cyclic ester produces polycaprolactone polyols. 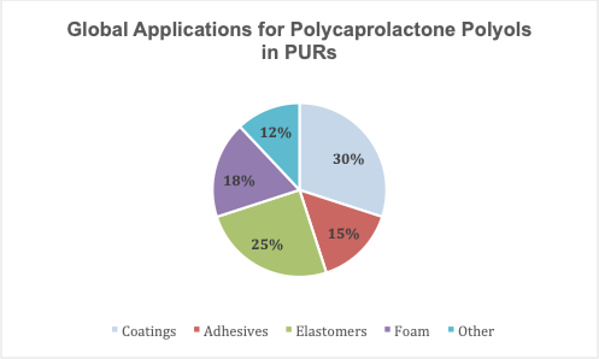 Formulators may use a wide variety of polyol initiators, allowing the design of shaped polymeric/oligomeric structures and customization of the performance profiles of the caprolactone polyols and their polyurethane elastomers. The lower reaction temperatures required, as well as the absence of an acidic reaction intermediate, affords PCL polyols with very low acid values (contributes to hydrolytic stability), low polydispersity (contributes to low viscosities), and perfect primary hydroxy end-functionalities (good stoichiometry control with reactivities that can be adjusted to meet your specific application requirements). Formulators can select the initiator to enhance properties such as hydrophobicity or hydrophilicity, flexibility, etc. See the Figure below, as R-[-OH] f represents a polyol “initiator”. Even with high functionality polyols (f >3), we don’t see crosslinking in the ROP process in a hyper-branched polyol architecture. In contrast, adipate polyester polyols are produced by the condensation reaction of a dicarboxylic acid and a diol or triol. Dicarboxylic acid monomers, such as adipic acid, leave residual acidic moieties, which adversely affect properties like hydrolytic stability. As a result, adipate based polyester polyols show acid values in the range of 0.5-1.0 KOHmg/g. Caprolactone polyols show acid values of under 0.15 KOH mg/g; Placcel® T (low acid) grades show acid values of ≤0.03 KOHmg/g, considerably lower than the average values for any conventional polyester polyol. Further, the adipate polyester polyols cannot be produced with higher functionality polyol, without experiencing crosslinking reactions. Below are just some of the “initiator” diols that formulators use, and the key characteristics of the resulting polycaprolactone polyols in a polyurethane elastomer. Pentaerythritol: Tetrafunctional, improved hardness and resistance properties. In polyurethane elastomers, some polycaprolactone polyols exhibit crystallinity and “cold hardening,” with melting points of 30-60 °C. The following passage summarizes the general “cold hardening” characteristics of caprolactone polyol-based PURs using various “initiator diols.” Cold hardening is a significant increase in Durometer due to crystallization of the soft segment in the PUR. If the polymerization initiator has a methyl group as a side chain, e.g. NPG, crystallization of the soft block decreases, but strength properties also decrease. As the average molecular weight of the polyol increases, so does the crystallization rate and onset of “cold hardening”. This is particularly so at a molecular weight of 2000 and above. The initiator also affects the glass transition temperature of the polycaprolactone soft segment in a polyurethane. Tgs below -30 °C are achievable with branched initiators. In polyurethane elastomers, the polycaprolactone polyols can be designed to meet the unique requirements in all types of coatings, cast and TPU parts for mining and oil field equipment. scrapers & conveyor belts, cast wheels, sprockets and rollers, adhesives, hydraulic & pneumatics seals and foamed products. Polycaprolactone is a high molecular weight, biodegradable, semi-crystalline, thermoplastic polymer which has a melting point of 60 °C and a Tg of – 60 °C. The crystallinity of polycaprolactone decreases with increasing molecular weight. With a melting point of only 60°C, it can be hand-shaped after a few minutes in hot water and hardened by cooling below the melting point. This feature allows applications such as modelling, mold production, prototyping, hot-melt adhesives, and orthopedic splint materials. Polycaprolactone is compatible with a with range of other materials where it is blended as a processing aid, impact modifier and polymeric plasticizer (e.g. with PVC). The low toxicity of polycaprolactone and biodegradation and bioresorption characteristics have led to increased adoption in the healthcare industry as implants, implantable drug delivery systems, wound dressings and orthopedic splint materials. To explore how caprolactone monomer and its derivatives can address your company’s unique needs, partner with Gantrade. Our team, armed with a wealth of technical knowledge and expertise, can guide you to the best solutions for your applications. Contact Gantrade today to get started. We offer a wide portfolio of products for CASE, polymers & resins and polyurethane applications.